The billboards started just south of Fayetteville, North Carolina. 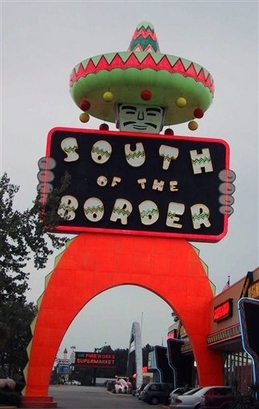 I had heard of South of the Border for years. I knew it was in South Carolina. I had never been to South Carolina. I really had no interest in stopping there as I had about a 500 mile drive that day. But the billboards were very interesting. It seemed like everything imaginable was there and I remembered a case study in college on Wall Drug. I envisioned something similar. Wall Drug offered free ice water to travelers headed toward the Badlands in SD and it grew to become an American icon. Someday, I would like to see it. As I drove further south, the billboards increased with frequency, and as I glanced at my gas guage, I figured I might as well stop. It seemed to be a relic of the past in the days before Disney World. Back in the days of cabins along US Highways and regional attractions like the defunct Land of Makebelieve in Upper Jay, New York. There were numerous buildings and a huge water tower with a sombrero. I went into a shop or two and saw the gas prices. I bought nothing. Nada. I saw a mostly deserted parking lot though to be fair it was only about 9:30 a.m. So, in terms of marketing, did they succeed or did they fail? The truth was somewhere in the middle. They did succeed in getting me to exit the highway to stop at the place. And had they possessed a display of t-shirts for kids inside the t-shirt store, I would have bought a few of them. But, they did not seem to have what I was looking for. So, I decided to hit the road. I suppose I could have looked at the other shops, but it appeared that the advertising which may have worked in 1970 did not work in 2009. At least it did not get me to buy anything which was the whole point of the money spent on advertising billboards. Consider your own marketing efforts. Do people say, "I have heard of that place"? Or, do they say, "I have done business there and you should, too"? Sometimes, you think the billboard is the answer. But, it merely is a confirmation of other marketing efforts which result in warm referrals. And those marketing efforts involve making your present clients happy they have chosen to do business with you. Otherwise, they may end up like me in that parking lot wondering why the heck I stopped in the first place.